Trademarks and more. Much more. 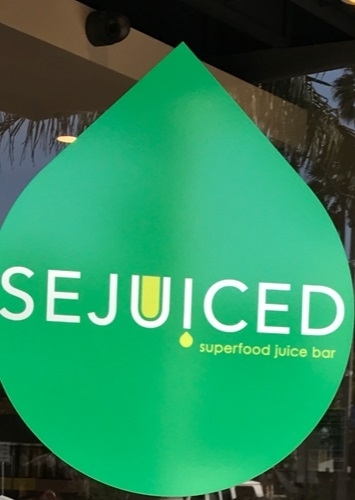 So of course there has to be a juice bar, right? Because California, right? I just can’t decide whether or not this is what I call a shitmanteau (and yes, if you follow me on Twitter you are well aware that I am trying to make #shitmanteau happen) – i.e., a portmanteau that just doesn’t work. I think I’m going to err on the side of calling this a shitmanteau because the “sej” part of the word is so incongruous to the English language. But your mileage may vary. Meanwhile, the Summer House restaurant just next door was a superb lunch location and our weekend getaway to sunny southern California was everything we could’ve hoped for – good friends, good food and wine, serious Fitbit mileage, real estate envy, and always, always in the OC (don’t call it that), quoting from Arrested Development.